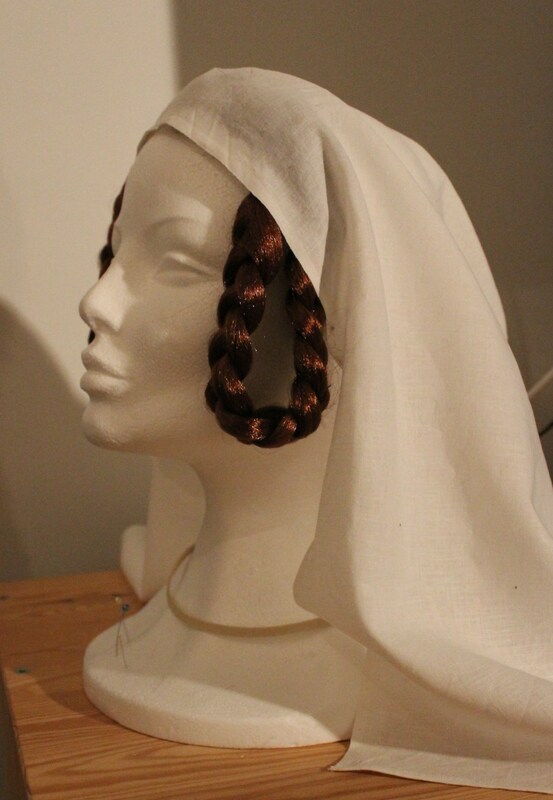 When figuring out the style of my new medieval costume, I also needed to think about hairstyles and headwear. 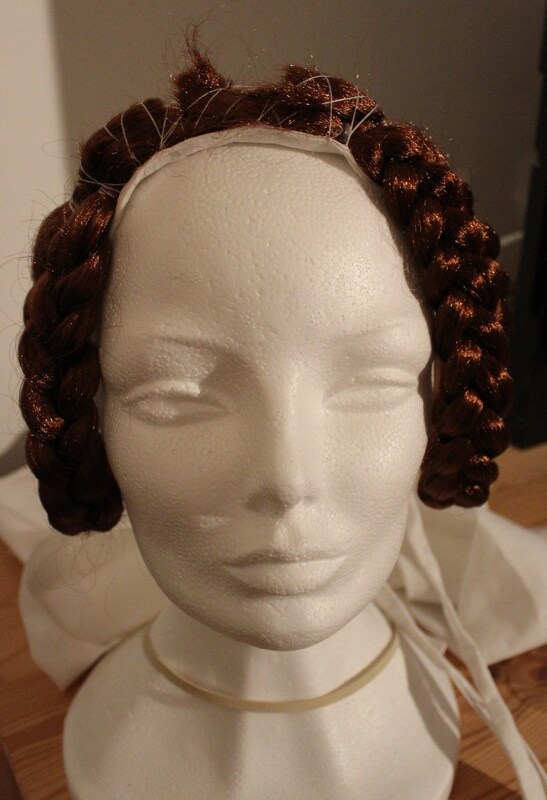 And since my own cropped hair wouldn’t do for any historical hairstyling what so ever, I needed something to cover it up. 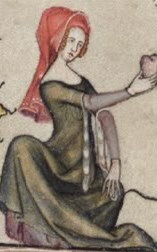 The girl is wearing her hair in tails coild at the ears, and some sort of whimple on the head. 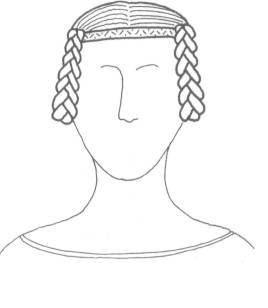 And it looks like this girl is wearing the same hairstyle, but without the headcloth. 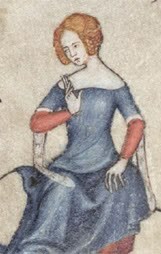 I also found this picture in “The Medieval Tailors Assistance”, showing the same hairstyle. 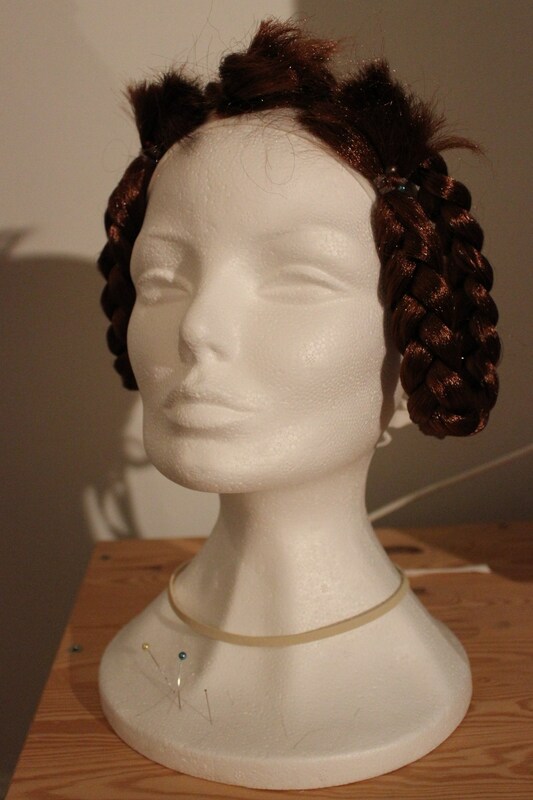 So my next step was to by a wig. 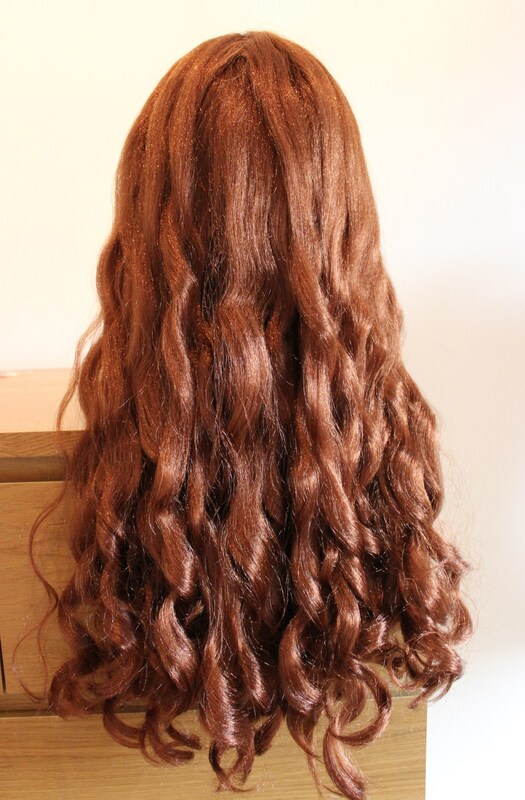 I wanted a long-haired wig, in a colour that would be axcepted as and look simular to mine. 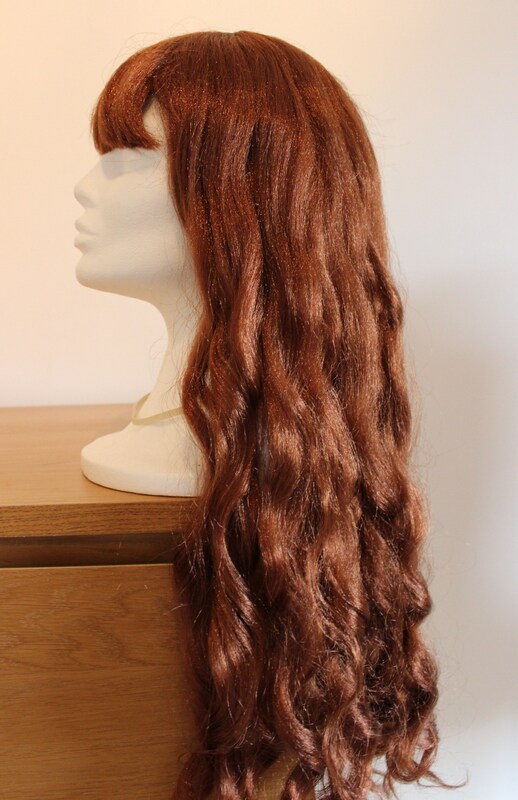 I found this (extremly sexified) wig on the internet for 150 Sek (15 USD). Exept for the bangs, it looked perfect. 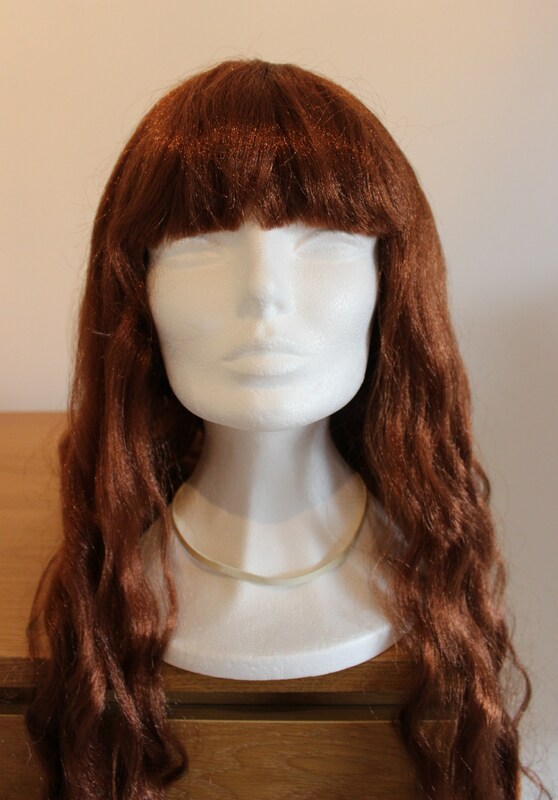 But these cheep wigs have a way of being horrible and ugly in real life, so you never know until you tryed it on. 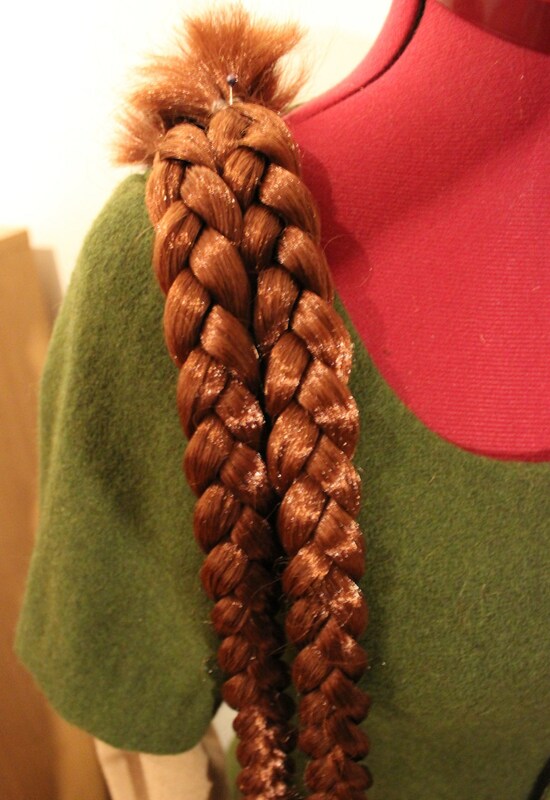 The colour and lenght is perfect, and the pretty curls held their shape really well. 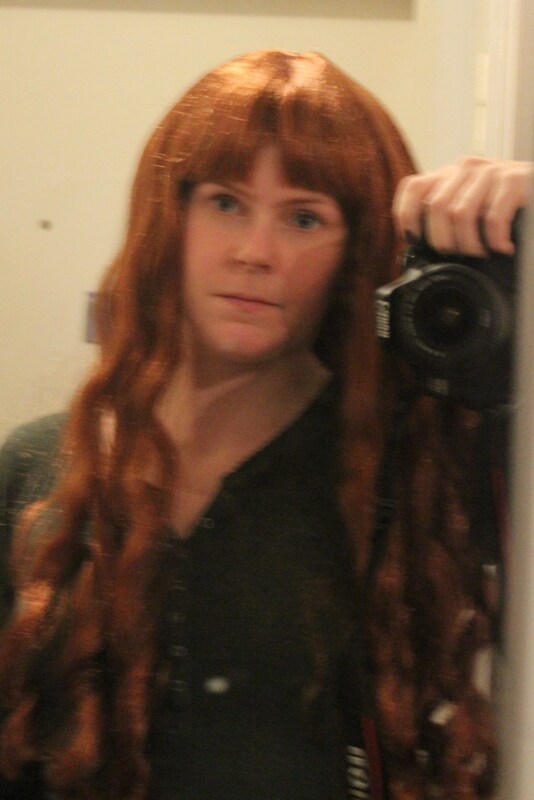 But I knew I could not use it as it where because of the bangs, and the heat stroke I would get by wearing a syntetic wig. 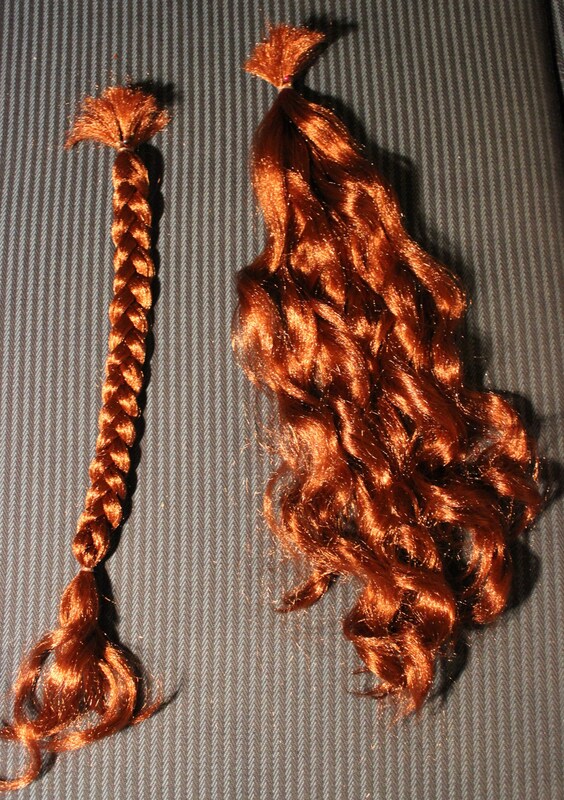 So I cut some of the sections of, and collected them into ponytails using smal rubber band, and then made them into braids. 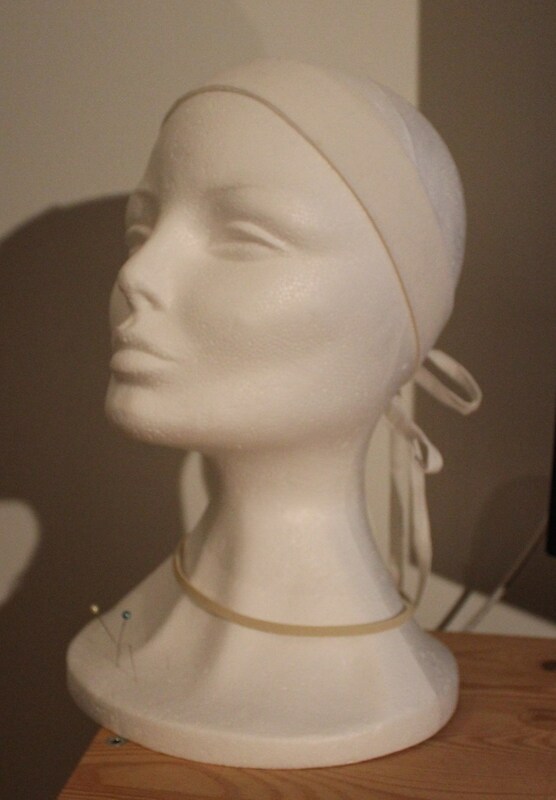 Then it was time to do the headcloth. 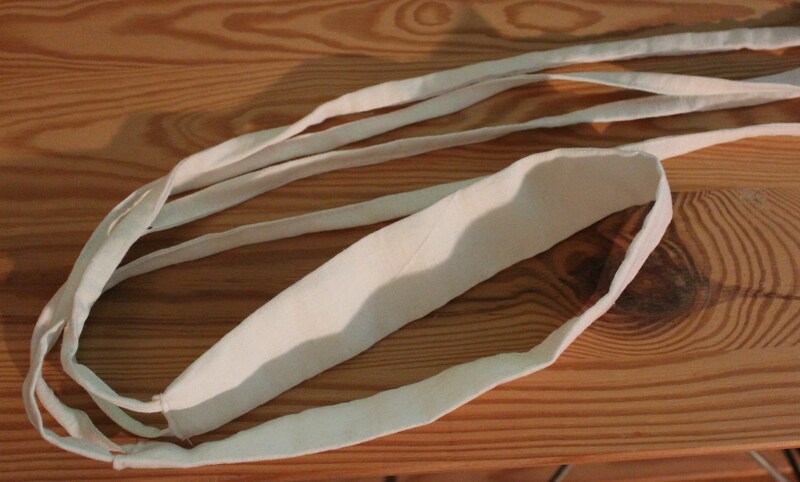 I cut stripes of fabric and sewed a simple headband – on to which I will pin the braided hair and whimple. It ties in the back with dubble ribbon. 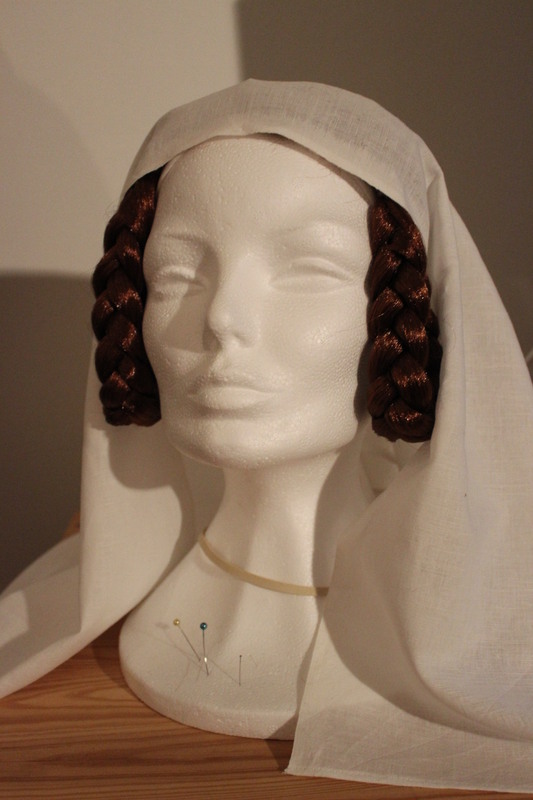 Then I draped the braids on the headband. And secured them by sewing them to the cloth. 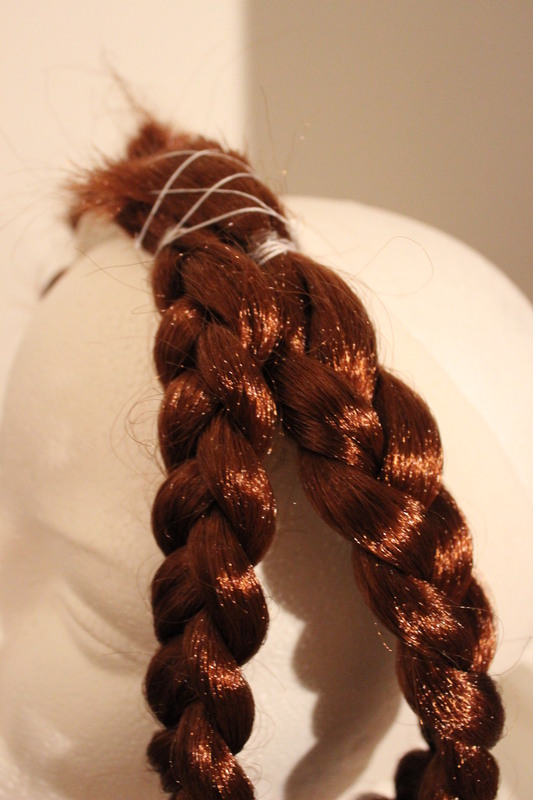 I then cut and hemmed the cresent shaped whimple, and draped it on top of the braids, securing it by pinning it to the headband behind the ears.